MARLBOROUGH, Mass., July 29, 2016 – Sunovion Pharmaceuticals Inc. (Sunovion) today announced that it has submitted a New Drug Application (NDA) to the U.S. Food and Drug Administration (FDA) for SUN-101/eFlow®, an investigational treatment for the long-term, maintenance treatment of airflow obstruction in patients with chronic obstructive pulmonary disease (COPD). 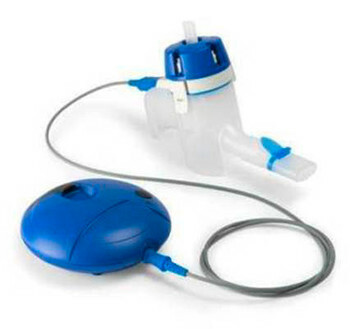 The submission is based on the positive results of the GOLDEN (Glycopyrrolate for Obstructive Lung Disease via Electronic Nebulizer) clinical trials program, which evaluated the efficacy and safety of SUN-101 (glycopyrrolate), a nebulized long-acting muscarinic antagonist (LAMA) delivered via an innovative investigational eFlow® nebulizer system (SUN-101/eFlow®). The GOLDEN program included three Phase 3 clinical trials. GOLDEN-3 and GOLDEN-4 were Phase 3, 12-week, randomized, double-blind, placebo-controlled, parallel-group, multicenter efficacy and safety trials comparing SUN-101/eFlow® with placebo in patients with moderate-to-very severe COPD. GOLDEN-5 was a Phase 3, 48-week, randomized, open-label, active-controlled, parallel-group, multicenter safety trial designed to evaluate the long term safety and tolerability of SUN-101/eFlow® in patients with moderate-to-very severe COPD. "Patients are at the heart of everything we do at Sunovion," said Antony Loebel, M.D., Executive Vice President and Chief Medical Officer at Sunovion, Head of Global Clinical Development for Sumitomo Dainippon Pharma Group. "This is an important milestone for us and the larger respiratory community, as we continue our mission of pioneering innovative treatments and therapies for COPD patients, their caregivers and healthcare providers." SUN-101 (glycopyrrolate) is a long-acting muscarinic antagonist (LAMA) bronchodilator delivered via the innovative, proprietary investigational eFlow® nebulizer closed system for the treatment of patients with moderate-to-very severe chronic obstructive pulmonary disease (COPD). The investigational combined product, consisting of SUN-101 and the closed eFlow® nebulizer system which has been optimized for SUN-101 delivery, has not been approved by the U.S. Food and Drug Administration (FDA) for the treatment of COPD. GOLDEN (Glycopyrrolate for Obstructive Lung Disease via Electronic Nebulizer)-3 and GOLDEN-4 were Phase 3, 12-week, randomized, double-blind, placebo-controlled, parallel-group, multicenter, efficacy and safety trials comparing SUN-101/eFlow® with placebo in adults with moderate-to-very severe COPD. The GOLDEN-3 trial enrolled 653 people who were at least 40 years old, at 45 sites in the United States. The GOLDEN-4 trial enrolled 641 people who were at least 40 years old, at 49 sites in the United States. SUN-101/eFlow® 25 mcg, SUN-101/eFlow® 50 mcg or placebo was administered twice daily in these studies. The primary endpoint was the change from baseline in trough Forced Expiratory Volume in 1 second (FEV1) at Week 12. Secondary endpoints included standardized change from baseline at Week 12 in FEV1 area under the curve (AUC), change from baseline in trough forced vital capacity (FVC) at Week 12, change from baseline in health status measured by St. George's Respiratory Questionnaire and change in rescue medication use. Safety was assessed by the number of treatment-emergent adverse events (TEAE), serious adverse events (SAE) or major adverse cardiac events (MACE) and the number and percentage of study participants who discontinued the study due to TEAE [NCT02347761 and NCT02347774]. GOLDEN (Glycopyrrolate for Obstructive Lung Disease via Electronic Nebulizer)-5 was a Phase 3, 48-week, randomized, open-label, active-controlled, parallel-group, multicenter safety trial designed to evaluate the long term safety and tolerability of SUN-101/eFlow® in adults with moderate-to-very severe COPD. The study enrolled 1,087 patients at 111 investigational sites in the United States and Europe. The study evaluated 50 mcg of SUN-101/eFlow® delivered twice-daily and active comparator 18 mcg of Spiriva® (tiotropium bromide) delivered once-daily by the HandiHaler® device. The primary safety endpoints were: the number and percentage of study participants with treatment-emergent adverse events (TEAE), the number and percentage of study participants with treatment-emergent serious adverse events (SAE) and the number and percentage of study participants who discontinued the study due to TEAEs. The secondary endpoints are the mean change from baseline over 48 weeks in trough forced expiratory volume in one second (FEV1) for all subjects and number and percentage of subjects with MACE [NCT02276222]. The study included not only patients who were taking effective background long acting bronchodilator therapy but also patients with very severe disease and co-existing significant cardiovascular illness. Approximately 10 percent of the population were elderly (>75 years), 65 percent were classified as being high-risk cardiovascular patients and more than 40 percent were taking long acting bronchodilator therapy. Sunovion is a global biopharmaceutical company focused on the innovative application of science and medicine to help people with serious medical conditions. Sunovion's spirit of innovation is driven by the conviction that scientific excellence paired with meaningful advocacy and relevant education can improve lives. The Company has charted new paths to life-transforming treatments that reflect ongoing investments in research and development and an unwavering commitment to support people with psychiatric, neurological, and respiratory conditions. Sunovion's track record of discovery, development and commercialization of important therapies has included Brovana® (arformoterol tartrate), Latuda® (lurasidone HCI), and most recently Aptiom® (eslicarbazepine acetate). Headquartered in Marlborough, Mass. Sunovion is an indirect, wholly-owned subsidiary of Sumitomo Dainippon Pharma Co., Ltd. Sunovion Pharmaceuticals Europe Ltd., based in London, England, and Sunovion Pharmaceuticals Canada Inc., based in Mississauga, Ontario, are wholly-owned direct subsidiaries of Sunovion Pharmaceuticals Inc. Additional information can be found on the Company’s web sites: www.sunovion.com, www.sunovion.eu and www.sunovion.ca. Connect with Sunovion on Twitter @Sunovion and LinkedIn. Sumitomo Dainippon Pharma is a top-ten listed pharmaceutical company in Japan. Sumitomo Dainippon Pharma aims to create innovative pharmaceutical products in the Psychiatry & Neurology area and the Oncology area, which have been designated as the focus therapeutic areas. Sumitomo Dainippon Pharma is based on the merger in 2005 between Dainippon Pharmaceutical Co., Ltd., and Sumitomo Pharmaceuticals Co., Ltd. Today, Sumitomo Dainippon Pharma has about 7,000 employees worldwide. Additional information about Sumitomo Dainippon Pharma is available through its corporate website at www.ds-pharma.com. Spiriva® is a registered trademark of Boehringer Ingelheim Pharma GMBH & Co KG. HandiHaler® is a registered trademark of Boehringer Ingelheim Pharma GMBH & Co KG. Sunovion Pharmaceuticals Inc. is a U.S. subsidiary of Sumitomo Dainippon Pharma Co., Ltd. © 2016 Sunovion Pharmaceuticals Inc.